We recently received a call from a customer in distress concerning their 30+ year old public address system failing. They have had their IT guy and electrician working on the system and have given up. The PA system had a constant hum, many of the ceiling and PA horn speakers were not working. Furthermore they were blowing amplifiers, they had 120+ 1/2 watt ceiling speakers in their 70 – 80,000 square foot facility covering 3 floors which should consume 50-70 watts of power they had 3 600 watt amplifiers attached to the system to get over the failed speaker consumption and to power the remaining speakers. Arriving onsite the first thing I noticed is how frustrated the customer was, they literally have tried and thrown everything they had at the issue and nothing changed. As they said “we need an expert”. The easiest way to fix the problem is to remove the old and replace it with new, a full forklift upgrade of the public address system, every ceiling speaker, every horn speaker, every amplifier and every cable which wasn’t really a fiscally responsible option. We discussed a good time to arrive onsite and to begin troubleshooting. On site, we fired up the PA Amplifier and began our work, slowly and meticulously removing the speakers that were not working or were marginally working. Although a speaker is not working that does not mean that the pa speaker isn’t consuming power from the public address amplifier, typically is consumes more, in some cases results as a dead short on the PA system. During the troubleshooting and speaker replacement nearly 30% of the speakers needed replaced, over many hours of troubleshooting we eliminated no less than 3 dead shorts, one was both wires were grounded where prior troubleshooting and speaker work by well intentioned maintenance created the issue. In all we replaced almost 30% of all of the speakers, we were able to salvage all of the cabling except for a 10′ section. 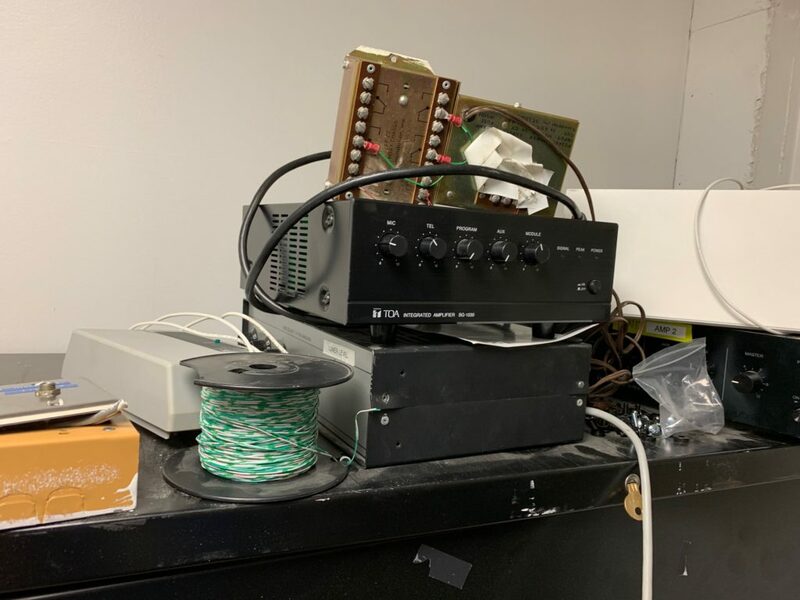 Also, of the 7 amplifiers onsite we were able to salvage one properly working 600 watt 70v amplifier that was working properly. Upon completion all 120+ of the speakers throughout the facility were operational, it is a mix of old and new, working flawlessly together. The customer was instructed to allow us to follow up with yearly maintenance and remove the failing speakers as they fail, not waiting until the issue becomes unmanageable, single small problems are easier troubleshot than many. The single amplifier is using less than 20% of it’s 600 watt capacity because all of the bad speakers and dead shorts have been removed from the system. I found this article very helpful on using public WiFi safely in the Columbus, Cincinnati and Dayton Areas. Ohio TeleCom can install your WiFi network in the Cincinnati, Columbus and Dayton areas, and make it safe for everyone using it, including guests and employees. “Public Wi-Fi is available just about everywhere, from the local coffee shop to the hotels and airports you visit while traveling. Wi-Fi has made our lives a little easier, but it also poses security risks to the personal information available on our laptops and smartphones. Here is a helpful list of dos and don’ts you should follow if you plan to use public Wi-Fi. This is a great article from CNet about the up and coming 5G networks and what to expect from your carrier. Even though the network is updated to 5G your 4G and 3G devices will still work for years to come. In turn there is no reason to wait to install a cell phone signal booster repeater. 5G is coming on strong. 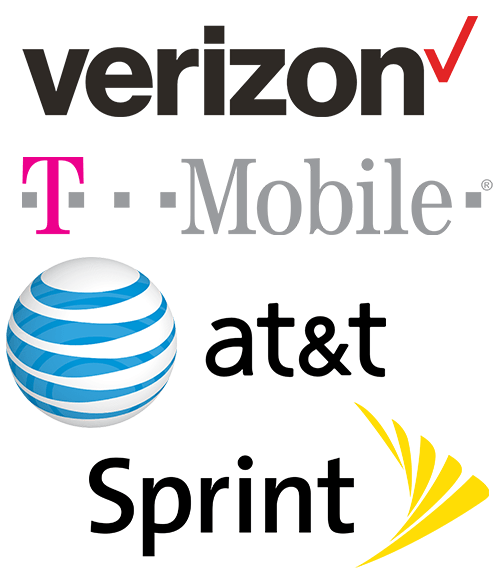 Let’s take a look at what AT&T, Verizon, T-Mobile, Sprint, Xfinity Mobile, Spectrum Mobile, Altice Mobile, Apple with the iPhone and Google with their Android and others are doing. Let’s take a look at what 5G services are available today and what’s coming next. In the race to mobile 5G, it seems AT&T and Verizon are in it to be first. While I understand there is an honor that goes to the winner, in the scheme of things does it really make much of a difference to users? After all both Apple iPhone and Google Android compete and Apple is always later with 5G, by choice. After all, over time, both AT&T and Verizon were tops in 2G, 3G and 4G. Will 5G be any different depending on who is first? I guess it has to do with bragging rights. So, let’s take a closer look at what is available today and what’s coming next. The kick-off for this new game is that mobile 5G is already available today in some markets from AT&T Mobility. That will expand over coming years. However, if you want to use 5G services today, you may just be in luck if you are an AT&T Mobility customer in one of their newly upgrade markets. Bringing 5G to market is complex. It means putting all the slices together. Today, only AT&T has some markets ready. The problem is there are no handsets that operate on this new technology. So, until they are, AT&T has come up with a solution. A way for their customers to get 5G signal and speeds, without a 5G smartphone or tablet. AT&T Mobility is doing something very innovative. They are partnering with NETGEAR and using the Nighthawk 5G Mobile Hotspot device. Think of this device like the wi-fi available in Starbucks, McDonalds or countless other retailers. However, with this device, you are out and about and not stuck at one place. The Nighthawk connects to the 5G network and you connect to it with your 4G iPhone, Android or another smartphone. The Nighthawk is a bridge that lets you get 5G speeds even if you don’t yet have a 5G device. In fact, even after 5G devices are in the marketplace, users can continue to use this device. That means even though Apple will not likely update to 5G iPhones early on, users will still be able to get 5G speeds. That also means users won’t have to rush out and buy first generation 5G devices until they are ready. This puts the user in control over timing. This is a big head start for AT&T and their customers who really want mobile 5G and live in a place where the network has been upgraded. AT&T has a very aggressive upgrade schedule. They always lead moving into the next generation of devices and it looks like they are doing the same thing with 5G. Verizon Wireless is beginning their move into this new technology with a service called 5G Home. This is 5G, but it is not a mobile offering. I think they may likely use this 5G Home service to ultimately offer a wireless pay TV or FiOS service to their users. While Verizon users cannot get mobile 5G yet, that should begin later next year. As 5G continues to roll out over the next few years, I expect to see both AT&T and Verizon battling for first place in the minds of the marketplace. While this gives the winner bragging rights, I see both being real players in this new space, eventually. So, as you can see, AT&T and Verizon are taking two very different paths to 5G. When asking the average customer, what is the meaning of 5G, the answer is generally a faster wireless service. While that is absolutely true, 5G is not just a wireless service. It is also going to play a role in the wireline world. This new service will let companies offer fast wireless and fast home or office services. It will also empower new companies to move their business to the wireless space. I think wireless pay TV will be a service competing with the traditional cable TV and wireline IPTV or Internet pay TV. This will empower and radical transformation over several years in pay TV. Who will the leaders be when the dust settles? This will be the direction for a new wave of competitors in more traditional communications services like telephone, Internet and pay TV. 5G will also give new competitors a chance to reinvent more traditional businesses. Think about the way Uber and Lyft have reinvented the traditional and sleepy taxi and limousine industries. Now, think about the way wireless pay TV will transform traditional cable television. We will end up with many more competitors in the pay TV space. What else will be transformed? That’s the real question. The answer will blow you away. Every industry will transform. There will be early, transformational companies. Some of them may be from newcomers like Uber and Lyft, or from existing players like AT&T and Verizon in the pay TV space, or from the cable TV world like Comcast Xfinity, Charter Spectrum and Altice. In fact, we are seeing the more traditional cable TV competitors jumping into wireless. Comcast jumped in a year and a half ago with Xfinity Mobile. Charter jumped in a few months ago with Spectrum Mobile. Altice is expected to jump in next year with Altice Mobile. This is all very exciting as we are watching traditional industries completely reinvent themselves and expand. 5G is coming on strong and every company involved with wireless from networks to handset makers are all trying to capture the attention of the marketplace. Expect massive change on every device and service we use today. Expect non-wireless companies to jump into the cellular world just like Comcast, Charter and Altice. This change will happen over the next several years. Early adopters are companies who offer these services first, and their customers who want to be first. Then there are the others who will wait for these new paths to be trailblazed before starting their new journey. 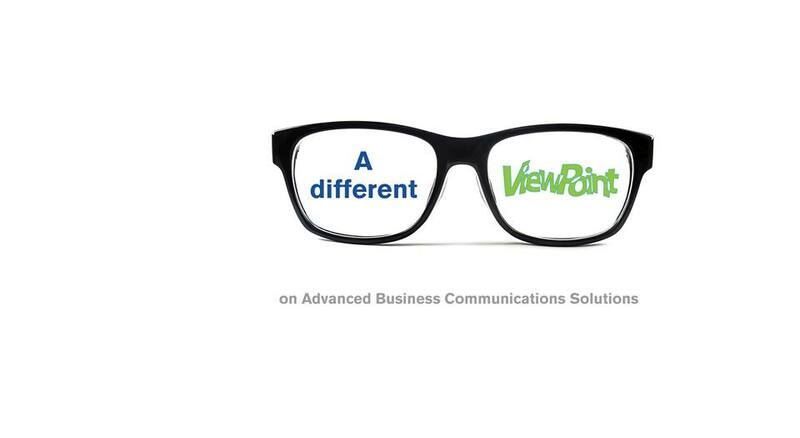 Looking at the world from these goggles, AT&T is the early adopter, blazing new trails and taking the arrows. Verizon comes along next. They don’t pave new roads, but they grow as well. This is the way these two have always operated and both AT&T and Verizon remain the industry leaders. This is similar to Google Android vs. Apple iPhone where one rushes into the next generation technology and the other waits. T-Mobile and Sprint have a more difficult path when it comes to transitioning to 5G and leading. T-Mobile has the marketing pizzazz but has little spectrum. Sprint has plenty of spectrum, but little in the way of marketing expertise. If they can eventually merge, the future looks strong for them as well. Any way you slice it, I hope you can see how this move toward the new world of 5G will empower the wireless industry, from networks to handset and tablet makers to all the business connectivity services. It will also impact every business in every industry. The early adopters will lead the way and the other competitors will follow them. The next decade will be fast and furious and wireless will be right in the middle of that universe. I love that because I have been watching wireless for more than 30 years. It’s an amazing place and things are just going to explode from here. 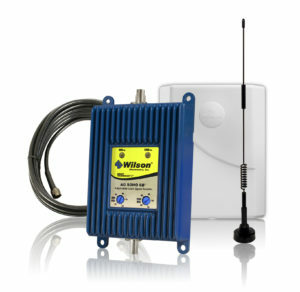 Cell phone signal boosters overcome the problem of dropped calls, limited range and slow data rates for cell phones and data cards by amplifying weak cellular signals. Our cell signal boosters are able to pick up weak cellular signals from a cell tower, amplify it and then transmit them to your cellular device, and then transmit a more powerful signal back to the tower. Causes Of Reduced Signal In Your Columbus Business Or Residence are unique topography of a location, overcrowded cell networks, inadequate mobile networks and cell towers, and even the materials used in the construction of buildings can all effect ability to have a strong wireless connection.Ohio TeleCom custom configures each installation to maximize the equipment to work best for your environment, your cellular repeater, mobile phone booster system for your unique application by choosing specific Wilson boosters, antennas and cellular accessories and boosting 3G, 4G, 5G, LTE signal strength by T-Mobile, Verizon, Sprint, and AT&T in the Dayton, Columbus and Cincinnati Metropolitan areas. This article originally appeared on CNET and in the winter 2017 edition of CNET Magazine. Click here for more magazine stories. It’s not your imagination. Robocalls and texts really are flooding your mobile phone with scams, spam and attempts to swindle. Americans received 2.4 million unwanted calls every month last year, according to a report by the Federal Communications Commission. That’s about 1 million more every month than in 2015. Sadly, ridding the world of these annoying calls is tricky because some things, like weather alerts and messages from schools and public utilities, are also made using automated call technology. Phone companies don’t want to block these legitimate calls. Here’s what you need to know to understand what’s going on. Why am I getting so many more annoying calls now? These days, a telemarketer just needs a computer, a modem and a program that selects and dials numbers from a database. That’s made it easy for scammers to make calls from overseas, where they’re harder to trace and crack down on. Wasn’t the National Do Not Call Registry supposed to stop this? Here’s the thing: It’s already illegal to send autodialed or prerecorded nonemergency calls to your wireless phone without your permission. It’s just that scammers and phishers don’t care if they’re breaking the law. Is it possible I’ve given consent without realizing it? It’s possible, but the FCC and Federal Trade Commission spell out that written consent is required. If you have consented to marketing calls as part of a contract, however, you can’t revoke your permission without the other party’s consent. Yes. Calls made for debt collection, charitable solicitation, political causes or campaigns and surveys are all exempt from the rules. Is there anything I can do to stop or slow down all these calls? • Ask your phone company to offer robocall-blocking technology for mobile lines. Most already offer some form of protection, although a few charge a fee. • Use a robocall-blocking app, and be sure to alert those apps when a number has slipped through so they block those calls in the future. • Don’t answer a call from an unknown or suspicious number, since that tells scammers they’ve reached a legit line they can sell to other telemarketers and scammers. • File a complaint with the FCC or the FTC. The FCC can issue warning citations and impose fines, but it doesn’t award individual damages. The FTC can file lawsuits against companies or individuals violating its rules. • Forward spam text messages sent from a phone number to 7726 (or SPAM), a free text exchange among wireless carriers. The bottom line: There’s no single solution to slowing down the flood of robocalls and spam texts. But with patience and the right approach, we can keep our heads above water.